You can have a White Christmas with the latest Ltd Edition flavour release from the New Covent Garden Soup Co.
My children are desperate for it to snow while they are off school for Christmas but the forecast for our region shows no sign of any falling white stuff at all in the near future. There is one way for them to enjoy a white Christmas this year but it involves a new rich and tasty soup rather than any weather-related events! The New Covent Garden Soup Co. has created the perfect winter warmer to cosy up with this season. 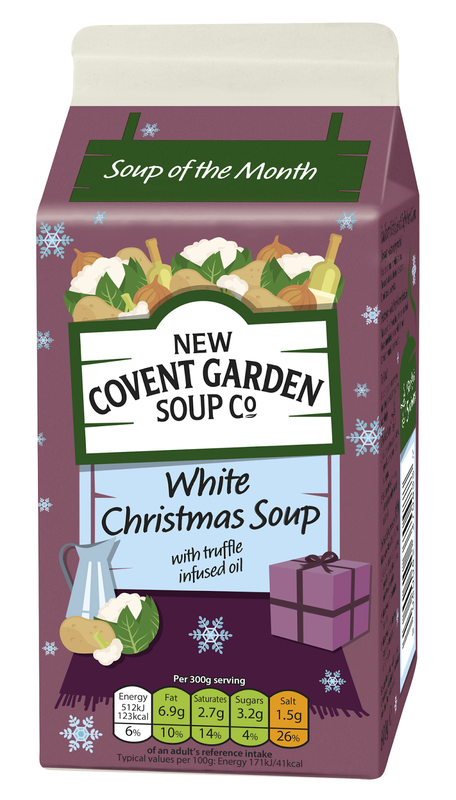 The new limited edition White Christmas Soup has been chosen as December's Soup of the Month by the company and includes a delicious blend of potato, cauliflower, cream, aromatic truffle infused oil and white wine. Ideal to pick up for a quick cosy supper after Christmas or sales shopping or to share with friends for a welcome change to turkey sandwiches on Boxing Day. The White Christmas soup is suitable for vegetarians and is available from all the usual retailers RRP £2.20. The New Covent Garden Soup Co. produce more than 30 delicious flavours across the core recipes (such as Carrot & Coriander and Chicken & Root Vegetable); low calorie Skinny range (Piri Piri Chicken and Goan Spiced Chicken & Lentils); and the new ‘Taste of Health’ range (Multigrain Risotto with Greens and Tomato & Spinach with Five Beans) range. Disclaimer: I was sent a voucher to try the soup for the purposes of this review.Views and opinions remain honest and my own.